We manage all activities required to deliver quality, safe, cost effective raw products to the plant dock. Commodities Supplied: Apple, Peach, Sour Cherry, Popcorn, Snap Beans, Sweet Corn, Green Peas, Carrots, Butternut Squash, Rutabaga, Turnip, Spinach, Collard Greens, Turnip Greens, Red Beet. Agricultural Management Services: Grower contracting, pesticide monitoring and reporting, product traceability to source location. Currently providing production certified for SYSCO Sustainable, TESCO, USDA GAP. Experienced in Organic Production and Certification. 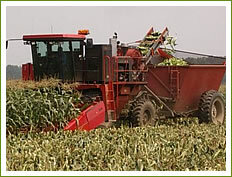 Agricultural Logistics: We provide harvesting services, transportation, receiving, and storage. Grower Accounting: We make direct grower payments, consolidated billing for customers.